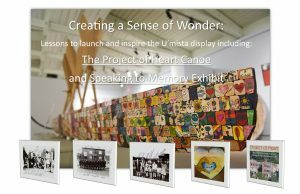 We are very fortunate to have been lent the sacred, Project of Heart Canoe. It is on loan to us from Surrey school district. Curriculum Support Teachers and Aboriginal Resource Teachers of SD 71 met during the first week of January, 2018 to create a series of lessons in preparation for students and teachers visiting this display. We wanted to get students noticing, thinking and wondering using images and picture books. Many students were able to tap into their background knowledge and make connections to their understanding of residential schools. These lessons have been well received. Even if you don’t have access to this exhibit, we hope these lessons are helpful as you lead students toward truth and reconciliation.